Kevin Kelly, Cincinnati Area Board of Realtors President, said "We continue to see home sales increasing and home prices continue to see positive momentum. Fewer homes on the market and low interest rates continue to attract more buyers." Closings for April were up 24% and the sale price is up 5.5%. For the past 22 months, Cincinnati has seen increased sales. The inventory of homes for sale has declined 15% over April a year ago. This means that if priced correctly and in good condition, homes are likely to sell faster. Existing-home sale activity is up 9.7 percent over the 4.53 million-unit level in April 2012, according to a recent report by the National Association of REALTORS (NAR). 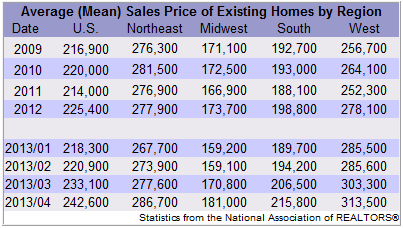 Existing-home sales, which include recently purchased single family, townhomes, condominiums, and co-ops are currently on pace to reach 4.97 million annual units, up from 4.94 million in March. NAR chief economist Lawrence Yun said the market is in full recovery. "The robust housing market recovery is occurring in spite of tight access to credit and limited inventory. Without these frictions, existing-home sales easily would be well above the 5-million unit pace," he said. "Buyer traffic is 31 percent stronger than a year ago, but sales are running only about 10 percent higher. It’s become quite clear that the only way to tame price growth to a manageable, healthy pace is higher levels of new home construction." Current existing-home sales are at their highest pace since November 2009, when the home buyer tax credit was available. Total monthly sales have improved over their year-ago levels for 22 consecutive months, while prices have risen 14 consecutive months over their year-ago levels.